But the colors doesn’t seem to be saved when I quit Terminal. It looks like the saving might not be working for the built-in themes – it certainly works for my custom one though. Try duplicating the theme you are using and changing the colours, then setting that to the default. I’ll look into the saving problem. Yes!! Thanks so much for this. This is an incredible lifeserver for someone who spends most of their day in Terminal and gets so frustrated by that unreadable dark blue. i was forced back to xterm for a while… i feel dirty… but now all is good again! thank you so much for this. All must know of the success. You are my hero. Apple owes you a beer. Why can’t those clowns see how necessary this is??? Brilliant Work! This was the number one annoyance on OSX 10.5 until moments ago! Let me just echo everyone else… thank you very much. This was a major annoyance for me as well… one of the few things that almost made me regret upgrading to Leopard so early. Sweet baby jesus and the orphans thank you. Would you consider releasing the source, so those of us who don’t want to bother with SIMBL can still look into getting this fix somehow? Also, confirming that the colors are saved only on a completely new theme; creating a theme with “Duplicate Settings” does not preserve these color settings after Terminal is quit. (the colors codes are found in manpage for ls: ‘man ls’). Sorry I was a bit negative… I just really want this to work, as I spend a good portion of my day inside terminals, and I haven’t yet found an application for the Mac that provides the customization I’m used to. This TerminalColors hack is incredibly useful, and I’d love to see it work perfectly. Make a new terminal profile. Set all colors to custom under the ‘More…’ SIMBL hack. Uncheck ‘use bold fonts’, and check ‘use bright colors for bold text’. The ‘use bright colors’ checkbox appears to add a certain hex value to the normal color values, rather than using anything from the ‘Bright’ column of colors, since the bright colors change when you change the basic color. 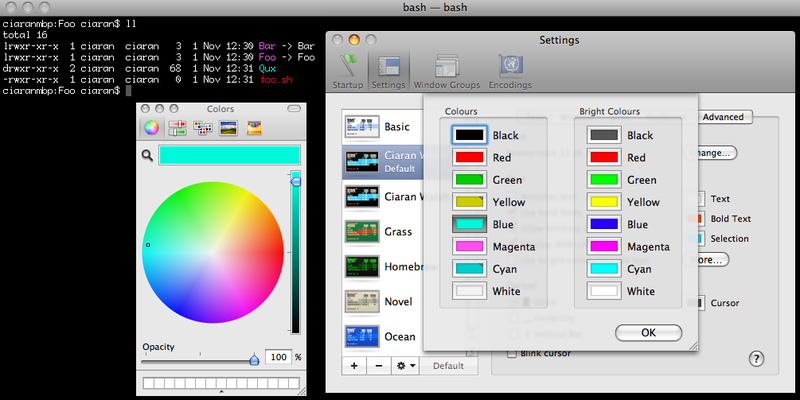 @ruthven: This hack allows you to configure those colours, e.g. in man ls you can see that an “a” in LSCOLORS specifies red – using this hack you can configure the red colour. @Ben: How exactly would you go about loading this into Terminal without SIMBL? The lower right hand portion of the screenshot shows the text from an ansi-enabled application I’m using in the terminal. I’d like for the ‘bright’ (ansi bold code) to show up using the custom colors selected in the ‘bright’ column of the terminal hack. I can’t find anywhere that the actual ‘Bold Text’ color shows up – as far as I know, with this configuration and this application, it’s unused. Trance: And what is this ANSI-enabled application? After about a week and a half of squinting just to be able to read source-code comments, this little gem of your popped up on my radar and has been a blessing. Like some others, the new Terminal.app was making me sort-of regret the move to Leopard, but I was unwilling to revert to Tiger given all of the positive aspects of the new OS. Now we’re back in the green thanks to Ciarán. I knew that someone was going to step up to the plate on this, whether it be Mike Solomon or someone else. Ciarán, thank you a lot. You’ve saved the eyesight of thousands of command-line jockeys worldwide. By the way, SIMBL is correctly installed (I have Visor working, for example) — I just can’t seem to get any colour to appear in the Terminal window without resorting to ls -G.
Trance: I took a look at TinTin++ but I don’t know what I need to do to observe the issue – could you please provide me with minimal steps to reproduce so I can take a look. Neil: I am not really sure what problem you are having, please explain what you expect to happen and what is actually happening. For example, you can see the same in GNU ls (ls –color=auto). The color seems to be not affected by bright color settings. The first #show command displays all the colors in dim (regular) format, and the second #show displays them in bold (bright). No matter what you change the bright colors to using TerminalColors, even if it’s changing Yellow to Magenta, it will still display as a more ‘washed out’ version of the non-bright color. As K said, this will show up in any use of ansi bold colors in the terminal, not limited to TT++. Possibly this script on the tt++ website works for the leopard terminal? The script doesn’t work, since it still uses the standard ansi color codes for the output. It’s a problem with the terminal application itself. As I said, this happens even with non-tt++ programs. TT++ was just an easy way of testing it. Trance is right, there is still a disconnect here after customizing the colors. The reason most of you aren’t noticing it is your “bright color” is simply the same hue with larger value. To see the issue, set your “bright color” for some color to something COMPLETELY DIFFERENT. For example, make the red “bright color” green. You can play around with the other checkboxes and see that there is no way to make “bright red” look green.. it always just looks like a brighter red. The whole “bright colours” column is being ignored. Why does this matter? Old Linux ANSI terminals (and probably many others, for all I know) display some colors substantially different in the bright version. In MUDs, for example, the “dark yellow” color was actually brown, and was used for brown things (everything leather, for example, was colored “dark yellow”). Yellow was yellow. Similarly, “dark red” was red, but “bright red” was more pinkish. Purists like me think this matters, a lot. Also, it doesn’t make much sense to have a “bright colours” column you can fiddle around with if it doesn’t actually do anything. Other than that, this SIMBL plugin rocks. BTW, it looks like the “bright colours” checkbox in Leopard actually means “increase value and reduce saturation”. That’s all it does, it doesn’t look up the “bright colour” value from the plugin. And because it reduces saturation, the magenta looks like crap. Thank you very much. I can see, I can see! Many thanks for this, very much appreciated. Wonder if it might be worth telling Mike Solomon about this so his site could link here. You are a legend Ciaran, thanks so much. It doesn’t save the colors for me still… even if I make a brand new theme. Any ideas? Terminal 2.0 (v237) has not been tested with the plugin TerminalColors 0.2.1 (v5). As a precaution, it has not been loaded. Please contact the plugin developer (not the SIMBL author) for further information. Any advice as to how to get around this will be greatly appreciated. Never mind. Version 0.2.1 is an older version. The problem has been fixed. I’m also having problem saving even if I create a completely new theme. Note that once Terminal is closed any changes to the colors will be lost. For clarity change that last line from - Note that once Terminal is closed any changes to the colors will be lost. Note that once Terminal is closed any subsequent changes to the colors will be lost. Ups. sorry guys. But I guess I did the same mistake than Jim Reese. I had the older 0.2.1 in /Library/Application Support/SIMBL and installed the new one to ~/Library/Application Support/SIMBL. Now that I have only the latest one from here installed everything works as expected. thanks. I cannot get the More.. button to show up. I believe I am doing everything correctly – single InputManagers location in /Library/, permissions set correctly, etc. Could it be that my mac is 1.8 GHz Core 2 Duo/10.5.1 (mac mini)? As far as I understand that has some 64bit extensions and from Alan’s page InputManagers cannot be loaded by any 64 bit process (number 7). Anybody has been successfull on such configuration? I just updated to the new Leopard 10.5.2 update. Unfortunately it seems to have broken/disabled TerminalColours. Any tips for re-enabling? Or does this require a new build? Here are the details of my installation location and the permissions. Install XCode developer tools from Leopard DVD. Change Root -> SIMBLTargetApplications -> 0 -> MaxBundleVersion value to 240. Works for me, but as you know, something may break… you have been warned. You can reactivate TerminalColours.bundle by editing BundleVersion properties in Info.plist. Open Terminal and follow the TerminalColours.bundle installation path. Inside the bundle directory, there should be Content/Info.plist file. Open it with your favorite editor and substitute every string “237″ with “240″(it appears twice in the file). Compatibility issue may exist, but it works fine for me. @Heejong Lee: Thanks for the tip! This also seems to work fine for me. @Heejong Lee: Thanks for the tip! Never realized how ugly the default terminal colors looks like. Thanks to you, I don’t have to suffer for another minute. Strange… I followed the instructions exactly and changed both 237′s to 240. Saved and relaunched Terminal but the colors are still missing. I did the steps outlined above, but it still crashes Terminal.app Has anyone run into TerminalColours crashing? This is on a G5, with 10.5.2. Thank you! This has bothered me for so long and now there is a simple fix. Any tips? I chown’d, installed, etcetra. What am I doing wrong? This isn’t working for me at all. All correctly installed. I’ve chowned. Everything. Even edited the info.plist. Nothing. I’m not receiving any error messages, I’m simply not getting a “more…” option under terminal. Is there anything I need to do to activate SIMBL? Is there a way to check if it’s running properly? Thanks for porting this for Leopard, my eyes were starting to hurt. It seems to load and work okay — but it seems to be failing to save my settings (as others reported above). I did create my own theme and changed the settings there, and set it to Default, but it still reverts the settings once I quit Terminal and re-launch. Actually .. it looks like it might have saved some of them, but not all of them, and I can’t seem to get it to change what it has saved. Many, many thanks. The dark blue on black background was driving me nuts. I had this issue as well. Once I got things tweaked the way I wanted, I exported my settings (Gear Icon -> Export…), deleted the original, then re-imported them. Seemed to do the trick. So are those of us on x86_64 Leopard just out of luck now? I seemed to have had this working in early versions of Leopard, but it broke during one of the updates somewhere along the line. There is so much conflicting information and instructions out there for all these bundles. I got it to work by setting all the permissions as they are instructed by the textmate wiki, linked from this blog entry. But both this post, and the textmate wiki tell you to put the bundles in the incorrect place. Yay, works for me on 10.5.3 and 1.8Ghz Core 2 Duo! The recipe: 1) Removed my previous attempts from ~/Library and /Library 2) Installed Xcode 3) Installed SIMBL 0.8.2 (goes in /Library/InputManagers) – it had the correct ownership root:admin 4) Copied TerminalColors.bundle (from step 2 in the original post) to /Library/Application\ Support/SIMBL/Plugins and changed the ownership to root:admin 5) Restarted Terminal.app – works!!! I think I will be avoiding any further os x upgrades now…. Well, I didn’t avoid the upgrade to 10.5.4 (and why does everyone tend to also specify their CPU?) because I found this hack afterward. For me, the bright colors will not apply to the terminal. According to previous post, I’ve tried, but without success: 1. creating a new theme, 2. exporting and importing a theme, 3. moving ~/Library/Application Support/SIMBL/Plugins/TerminalColors.bundle to /Library/InputManagers/SIMBL/Plugins plus chmod -R root:admin TerminalColors.bundle, 4. changing MinBundleVersion “237″ to “240″ (Max is already 240). 5. and restarting Terminal as necessary. And there appears to be a bug. When changing a color (at least with a slider), selecting another color, then selecting the first color again, the first color is reset, or perhaps one slider. I can’t figure it out any more than that right now. I’m having the same problem Particle Man with 10.5.4 what can we do? Just to let you know I will be trying to update this – I’ve been away from an internet connection for a little while and I’ve not updated to 10.5.4 yet. As soon as I do I’ll do my best to get a fix out. @Ciarán Have you found a solution? Rasheed: sorry, I’ve been trying to concentrate on fixing SVNMate. I have actually upgraded to 10.5.4 though and didn’t have any issues ith this plug-in at all, it all works fine. It sounds like Particle Man is actually just commenting about the bright colours, not that the plug-in doesn’t work. You probably just need to configure SIMBL properly. Ciarán: I don’t know if it’s because of SIMBL or your hack (“the plug-in”?). For me, the hack/plug-in loads fine. While changing the dark colors changes them in Terminal, changing the bright colors does not. Are you saying that it works properly for you? If so, how do you configure SIMBL “properly” for the plug-in to work? Apparently the given instructions do not work for at least Rasheed and myself. The problem for me is same as Particle Man, the bright colors.. I custom configuration and it saves fine I had a window group which for some reason needed to be updated. I deleted it duplicated the working custom config and created the groups again with same name. As a result my key binding for the group still works. ED: You most likely have an old version installed as well as the current one. Check in ~/Library/Application Support/SIMBL/PlugIns. YES!! Thank you so much. This will now be the first thing I install on any new macs. Please add support to change the font color like this Apple! This man knows how to do it!! Has anyone gotten this to work with 10.5.5? If so, what steps did you have to take? Launch Terminal, go to Preferences, click on Text tab and the “More” key is there. My eyes thanked Ciaran! this add-on rocks!! even if it is a bit tricky with having to “copy” the color profile for it to save the settings.. I join the praising chorus: Brilliant, man. Best tip i had since i got my macbook (3 weeks ago!). Thank you V-E-R-Y much! On Tiger, I have been using the TerminalColors hack with a couple of aliases on the desktop to .term files to start up Terminal with different settings. One starts a Terminal running pine, while the other just brings up a shell, with different colors. With the Terminal icon in the dock I could start up the the desired settings using the right-click menu, but that is much harder than just clicking on an icon. Is there a way to easily start Terminal with one of a few different settings? I teach, so my students thank you as well! FYI to modify a built-in scheme just change something else after tweaking the colors and it will save. ah Leopard only, lame… cheers to all who can read. The plugin will now load when launching Terminal.app. You can change colors in the Terminal.app preferences; however, only 16 colors are available in the terminal window. xterm-256 is not enabled. Has anyone gotten any closer than this to enabling 256 colors in Snow Leopards’ terminal? I can’t believe Apple didn’t update terminal to support xterm-color by default! Argh! @Deavon – are you getting any luck to get it to work? I’ve update the source for TerminalColours and written a post about how to get it working in 10.6. Looking into this a bit further, I tried the “old” approach, ie. doing an “Export…” of the theme to a .terminal file and editing that. It looks like the colours are stored just as before as serialized NSColor objects. I took a known working .terminal export from my other still-Leopard Mac, confirmed the customised colours are in the file, and loaded it. No luck: it ignores the colours. Once SIMBL and TerminalColours are working and loaded (using the 32-bit setting and bumping MaxBundleVersion up), I think TerminalColours is doing what it’s meant to, but Terminal.app is just ignoring the settings. I did a “strings” on the Terminal.app binary, and it looks like strings such as “blueColor” are still there, as are methods like “colorForANSIColor:”. Interestingly, one thing has changed: in Leopard .terminal files, these settings were spelled “blueColour”, whereas in Snow Leopard, they’ve changed to “blueColor”. Bizarrely, I can’t find any mention of “blueColour” in the Leopard Terminal.app strings, so I don’t know how that’s working. Oh, it looks like someone’s already done it Serves me right for not adequately googling. This looks pretty good, hopefully Apple will make it official some day. Note that there’s an ANSI colors editor in MacTelnet, which can be used as a replacement for Terminal on Mac OS X. I personally find it more customizable for these kinds of things. This solution was working fine for me in Snow Leopard, but after a reboot, this no longer works. Terminal.app is still set for 32-bit mode, but all my lovely colors are gone. Hmmmm… Re-installing SIMBL seems to fix my problem. I hope I don’t have to reinstall every time I reboot. Hey, I went through Trance’s, Rasheed, and Particle Man’s post but I never saw a solution. Is there a way to get bright colors to work? I would like to have 16 colors to play with instead of 8. I would like, for instance, bright red to be a dark grey instead of a lighter value of the red color. Unfortunately the terminal seems to just add a hex value to whatever the normal color is. Awesome! Solved a problem that has bugged me for a year now! Thanks! I’ve installed the latest version of SIMBL (0.9.3b) and restarted Terminal a few times, and always get this message, so I don’t know what to do at this point. Would appreciate a response either way. I’ve tried all the different versions w/ each other and still nothing. The ANSI “More…” option shows, but no colors in term. I’ve even tried Duplicating Settings to no effect. Someone please come up with a hack before I bust a vein in my brain. OK, I think I figured it out, but it was a pain in the but and there are little tweaks that are easy to miss. http://github.com/brodie/terminalcolours/downloads has the latest terminalcolour with 10.6, 64bit terminal, and simbl .9.x support. SIMBL has updated to 64-bit. Can you please update TerminalColours to work with the new version of Terminal. Oops, wrong post. That was patch for tab switching. Had this working on 10.5.x, but no luck w/ 10.6.1. The “More” button shows up; however, Terminal ignores the colors. I wish I could get this working in snow leopard, I miss the visual cues about my files. I’m also looking to get colors workin’ in Snow Leopard… Help!! I merged evanphx’s Snow Leopard fixes with other 64bit fixes I found on github. With this newer bundle and the newest SIMBL that works on Snow Leopard, you don’t need to open the Terminal in 32bit mode any more. Follow the same instructions: install the latest SIMBL for Snow Leopard, unzip the file, copy the bundle to the SIMBL plugin folder, and then restart Terminal.app. @timmfin: That still isn’t working for me. Do I have to do anything special? Hope this helps. Anyone else having trouble with this bundle? Thanks for the reply, @timmfin. The “More” button does appear, but the colors in Terminal are not affected at all. Still just white text. @jake: Hrm. Here are a few last guesses. Do you have “Display ANSI colors” checked? Also you need to make sure that the profile you are editing matches the terminal window that is open. To double check, used the Shell -> New window menu action to pick the exact profile you are editing. I followed your instructions, puts all buddles under ~/Library/Application Settings/SIMBL/Plugins folder, it didn’t work, but when i moved these buddles to ~/Library/Application Supports/SIMBL/Plugins, it works! @liwei: Thanks, I must have totally blanked out when I was typing those instructions. I thought I was helping people (instead of referring them to the original instructions far above)… but I actually made it a lot harder . Is this totally working for people on Snow Leopard? I get the “More” button, but the colors in my terminal are not affected at all? Anyone else? Finally got this working again by removing TerminalColors then restarting Terminal.app. Installing it cleanly and making sure that root has read/write to the bundle seems to have fixed it. Thanks for all this -everyone! Yeah I have the same issues on Snow Leopard. The Bundle is installed and the “more” button is available and displaying the contents. When I ssh to a linux box the colours work fine but when I get back to my local Terminal its still in white. Any help with this would be great? Having the same “More..” button appears but colors don’t” issue on SL with a fresh install of SIMBL 0.9.7a, and @timmfin’s TerminalColors SL 64-bit compatible plugin (from GitHub) located in ~/Library/Application Support/SIMBL/Plugins/. Has anyone found a resolution for this issue? I tried and i succeed thanks. yay I finally got this to work. At first this didn’t work because I installed SIMBL-0.9.7a from http://culater.net/software/SIMBL/SIMBL.php. However, it turns out that SIMBL-0.9.7a is actually intended for Snow Leopard, so I uninstalled it. I installed SIMBL-0.8.2, and now the plugin works. Note to the author: Some of the newer blog posts contain Spam. Please check into it. Problem Resolved! Thanks to tips from you guys and some troubleshooting on my own, I have fixed the issue on my SnowLeopard (10.6.4) and would like to post the solution for anyone else with the same problem. Procedure: If you are getting the following error message “Terminal 2.1.1 (v273) has not been tested with the plugin TerminalColours (null) (v1.0). As a precaution…”, and you can’t get rid of it by removing TerminalColours.bundle, then you must completely remove SIMBL and re-install it. This includes the simbl.osax file. Before removing SIMBL, store any .bundle files you might have currently installed temporarily on your desktop. Delete the TerminalColours.bundle. They are located at ~/Library/Application Support/SIMBL. Now re-intall SIMBL (http://www.culater.net/software/SIMBL/SIMBL.php) and the error message should be GONE. If not, you didn’t completely uninstall SIMBL. Now you should install Visor 2.2 (http://visor.binaryage.com/) or if you don’t want visor, just the TerminalColours.bundle which DOESN’T cause the error message (http://bwaht.net/code/TerminalColours.bundle.zip). That said, I really really recommend Visor. Even if you don’t want the dropdown, you don’t have to enable this feature in Visor. Also, I have tested this method using Visor on two computers and it works. If you decide to use TerminalColours.bundle, you need to right click on the bundle in finder, and click “Show Package Contents…”, open the “Info.plist” file and change the MaxBundleVersion to 273, and CFBundleIdentifier to sh.ciaranwal.terminal-colours, or just see Ted Naleid’s post above. Open Terminal and it should be working. If you are annoyed by the “window blinking” issue when Terminal Opens (caused by Visor), i highly recommend adding Terminal to your login items and checking the “Hide” box. Terminal 2.1.1 (v273) has not been tested with the plugin TerminalColours (null) (v1.0). As a precaution, it has not been loaded. Please contact the plugin developer for further information. Thirding post 169… I’ve never used TerminalColours before but all roads on the internet lead to this page for people looking to have decent terminal coloring. Post 169-173 says it all !!! What chance an update? I’m using Terminal 2.0.2 in OSX 10.5.8. 1) comment 168, where I you change the max version in the info.plist. This gets rid of the plugin disabled because it’s not tested with this version error when you start up. 2) comment 67, you make changes to the theme, export them, delete the on you were editing, and import them. I couldn’t get changes to pick up without this.